When I moved to Logan Square in late 2017, Armitage Avenue was very must desolated. For several miles, there were buildings plastered with boards, vacant lots, and blight. Over the past few years, Logan Square has maintained a slow rejuvenation that has resulted in what is becoming a very attractive neighbourhood. 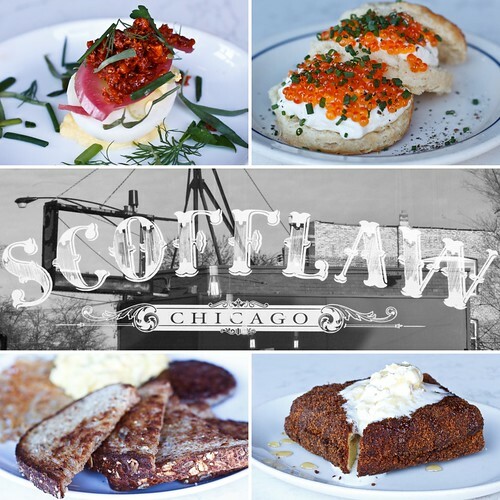 One restaurant that now has residence on the landscape as a replacement for what was once a local bar is Scofflaw at 3201 W. Armitage Avenue. Touted as a gin bar, it’s definitely a great gin bar also with brunch, dinner, and other cocktail offerings. Having tried to go one Friday evening only to walk into a room with not much navigation space, I opted for an early Sunday brunch for my return visit. Enjoying the cozy atmosphere, instead of enjoying a seat at one of the booths or small tables, the bar was where I parked myself. The brunch menu had a few items that caught my eye and after a brief acknowledgement that I was going to turn brunch in “drunch,” I spied a few items that I figured I would enjoy slowly while indulging a flight of gin cocktails. The first landing was a devilled egg topped with crispy chicken skin, smoked buttermilk, and fermented celery. Another menu item was a plate of cathead biscuits, topped with cream cheese, trout roe, and chives. The third landing was Hong Kong style French toast that came with cashew butter and honey chamomile whipped cream. This is the best French toast ever! And the last landing was a simple breakfast of toast, sausage, and eggs scrambled with eggs. Not a smear or crumb was left afterwards. Now, the question now may be, “What exactly did you have to drink?” Wanting to partake of a few gin cocktails, I requested a flight of four different selections, not necessarily exact to the cocktail recipe. The first two were a gimlet and a jasmine, both made with Scofflaw Old Tom Gin. 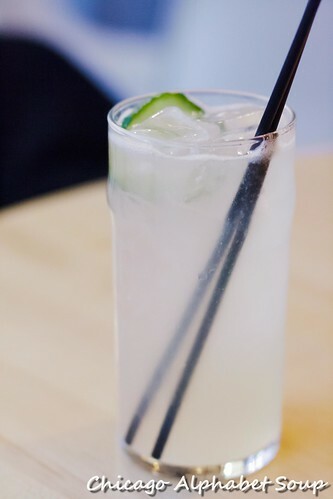 The gimlet was prepared with gin, lime juice and a little bit of sugar. 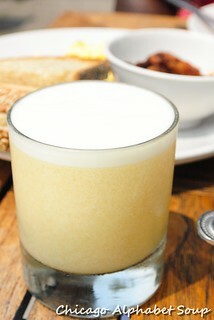 The jasmine was prepared with lemon juice, orange Combier, Compari, and a touch of simple sugar. The second part of the flight consisted of a classic martini and a negroni. These were made with St. George Terroir, based out of California. The Douglas fir in both helped to bring out a woody note in the sips. 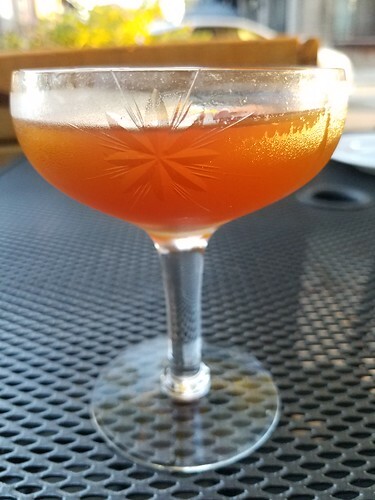 The martini had gin, dry vermouth, and a hint of orange bitters, topped with lemon zest. The negroni had gin, Campari, and sweet vermouth in it. 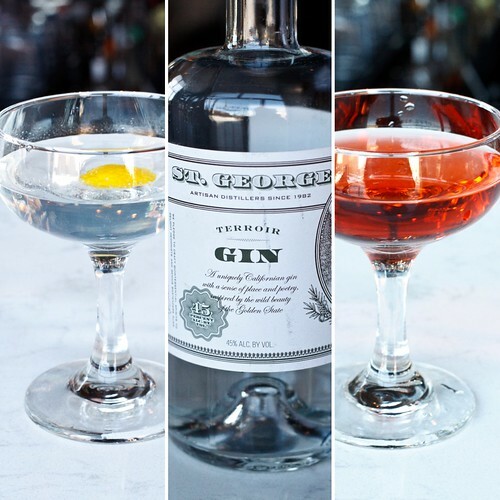 Being one who prefers darker alcohol, these four gin cocktails are now on my immediate go-to list. The final cocktails were hot to warm things up before going outside into frigid temperatures. 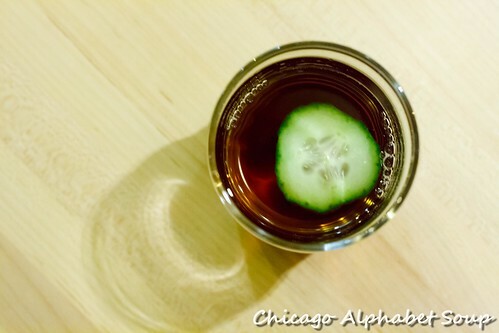 The was a wassail, that was made with gin instead of with bourbon. There was also a rum toddy just to introduce a darker spirit into the imbibing equation. Quite possibly not a part of the regular menu, these certainly are good for hastening warmth after coming inside from frosty temperatures and enough to make you not ever want to go back outside afterwards. The brunch crowd filled in quickly, an indication that service is great and quality of food and beverage are top. Having sat at the bar and engaged the bartenders in conversation, it was apparent that they are dynamic in their craft. The weekend evenings indeed see a packed restaurant, for sure. I have not gone during the middle of the week, but it’s a safe bet that this is a neighbourhood favourite for good reason. Chicago has plenty bars, but none specific to be a gin bar. 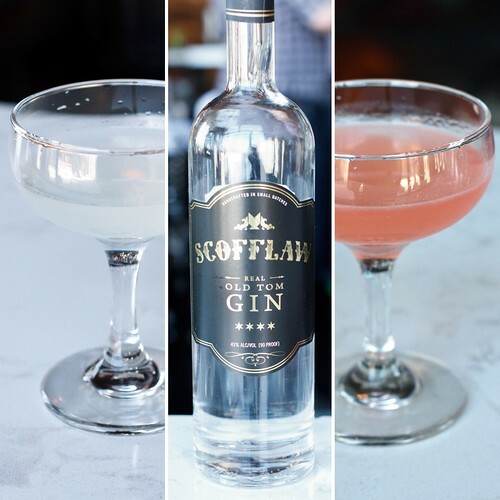 Scofflaw is certainly one I would recommend if you are wondering which one to try. After some time off, I have returned with my usual appetite. With the combination of the day job, personal travels, and getting control of weight gain that has resulted in me having to spend a good bit of money buying clothes that I can fit into now, yes, I had been absent. And when you live in a city like Chicago where you can’t walk too far without facing some inviting restaurant, you cave in a little, or a lot as I had been doing. 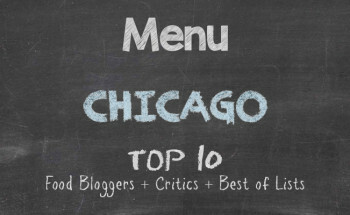 The term “farm to table” has been used for many restaurants that have had debuts on Chicago’s landscape. Being mostly enticed by cuisines from North Africa, West Africa, East Africa, Mediterranean, Italy, Asia, South America, and Central America, the farm to table theme seemed more like a phase, like the red velvet cake frenzy and the current doughnut bliss movement. 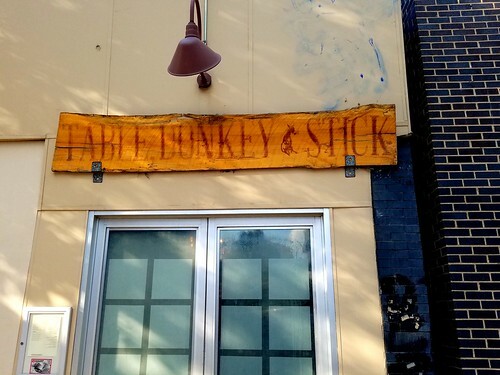 So, while having a casual walk through the eastern end of Logan Square, I passed by Table, Donkey and Stick at 2728 W. Armitage Avenue and decided that it was time to see what made this particular farm to table restaurant so appealing. Arriving a little after 6:00 PM, I figured there would be the after-work crowd in the main dining area, so I opted to sit out front to enjoy the nice weather and to take advantage of the last remaining natural light of the sunset for photos. With menu in one hand, a Dirty Chi cocktail in the other hand, I found a few items that piqued my appetite and sat back in anticipation for an enjoyable evening. Starting with a cheese platter was a fantastic option. 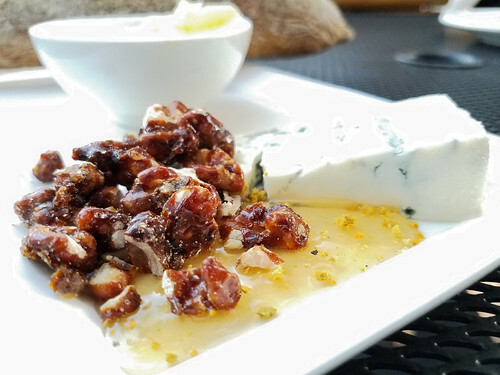 As a huge lover of creamy cheese, I was pleased with creamy gorgonzola dolce, honey, candied walnuts, butter, and a baguette. Put a footnote here. I hate nuts. Hate them. Absolutely, totally, completely hate them. And then I had a bit of the candied walnuts. Oh how I have been missing out. I love candied walnuts, or at least the ones at Table, Donkey and Stick. But spreading a bit of the cheese on the homemade baguette and dabbing it with the raw honey really made this small platter a winner. The second small plate I ordered was one of potato latkes with garlic aioli. These latkes were not of the large variety that one finds at Polish, Ukrainian, and other Eastern European restaurants. Noting the legend next to the menu item, this dish is vegetarian and free of gluten. 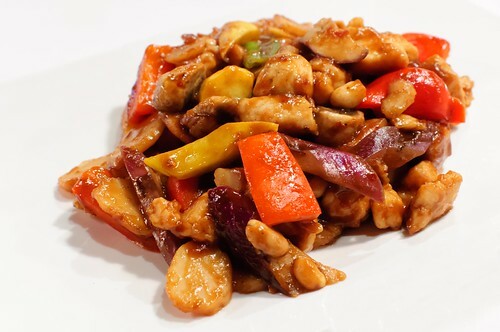 Given dietary restrictions and discipline, those who are vegetarian will love the kick in this small plate and those who are sensitive to gluten or who simply want to remove gluten from their diets will also enjoy each bite without worry, except that you may not feel you have had enough when you find yourself contemplating the last piece. And the house cultured butter made each bite that more tasty. Because I have been a bit restrictive with my diet while trying to get my waist size down to at least a size 34 — you never notice weight gain by looking at yourself daily, only that you can’t fit pants from the back of your closet with a size 30 waist, period — I have not partaken of my usual dosage of refreshing cocktails. And the Runner Up at Table, Donkey and Stick almost made me yell, “Compliments to the bartender,” from my outdoor seat. I saw that it had mezcal in it and that was all I needed to know that I would love it, but all the other ingredients in it made me all the more happier. Sticking with small plates, I had new smashed potatoes with farm beans and snails in a pesto. Wow! Wow! Wow! This should be the signature dish, and I’m saying that having been to the restaurant only once. No competing flavors on the palate, no complex flavors overpowering any of the ingredients in the recipe, no rubbery or mushy snails, and not a single crumb or smear of gravy left in the bowl after I had gone over every inch of it with the last bit of baguette. If you go for a proper sit-down, order the “signature dish” and let the server figure out what it is. This dish should never be removed from the menu. 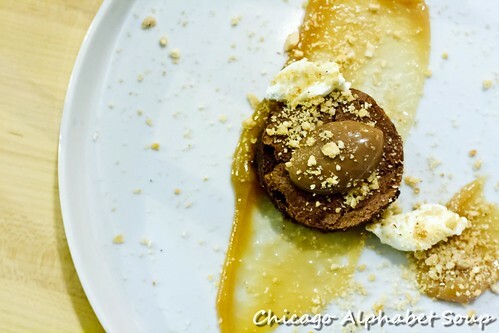 The finale was a case study in sweet and savory and how a check can present both in a dish that works well together. There was a scoop of blood orange sorbet that was my intended “light item” after having eaten so much food prior to dessert. And there were fried chicharronés. Often when restaurants try to marry sweet and savory, they do so in a single item that becomes a bit too busy on the palate. 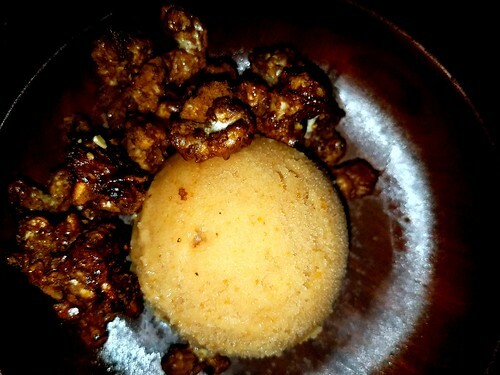 The beauty of the sorbet and chicharronés here is that you could enjoy them solo or together without disappointment. Like all of the prior small courses, this one ended on a good note. 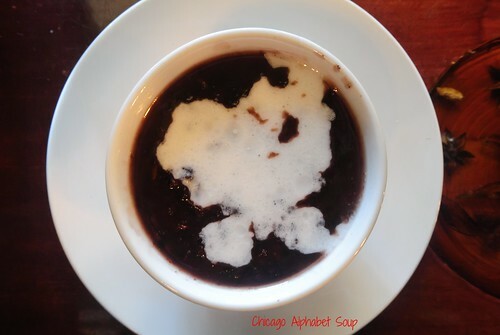 Since I moved to Logan Square in 2007, it has become a landing spot for some of the most popular and most recommended restaurants in Chicago. 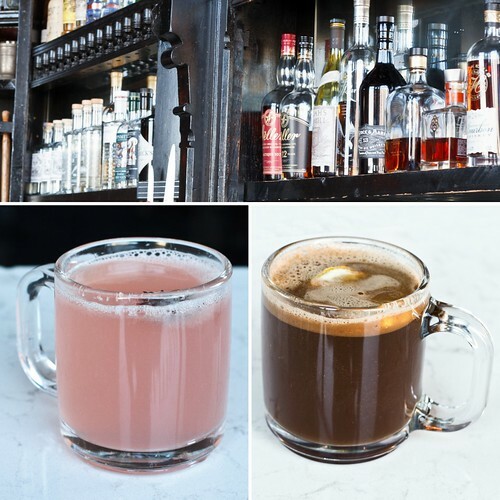 For a neighborhood that had been plagued with a bad reputation, the presence of restaurants that receive high recommendations and notoriety is something that residents of Logan Square can brag about. Table, Donkey and Stick is a very unassuming restaurant from the street, no flash, no flare, no “look at me,” but when you do notice it and put your feet under one of the tables for enjoyment, you really do come to realize that restaurants with no fancy airs are the best. Three things I discovered: I can indulge farm to table, I love candied walnuts, and Logan Square does indeed have the best unpretentious restaurants in the city. After a few months of slacking off from my gym regiments because it has been so nice after work that I’ve been busy lifting knives, forks, and spoons instead of weights, my clothes are fitting me a bit tighter than I would like. That means buying new clothes that have breathing room or getting back to my workout routine. 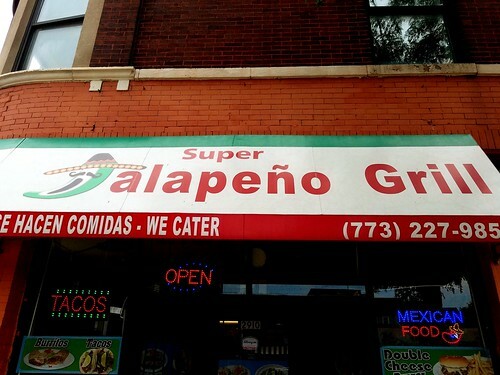 So, while biking twenty miles recently, on my return home I passed by a restaurant that I order from online — Super Jalapeño Grill at 2910 W. Armitage Avenue. And what should I do but stop in any undo my long distance ride. Certainly not a medium or big box restaurant, it’s one of countless taquerias in Chicago where you get real Mexican food, not an attempt at Mexican. There is nothing fancy about the restaurant and once the food arrives at the table, you really don’t care. Since I had already endured one hour of CrossFit, 45 minutes of kickboxing, and a little under an hour of biking, I was ready to sink my fangs into something to tide me over until I got home. 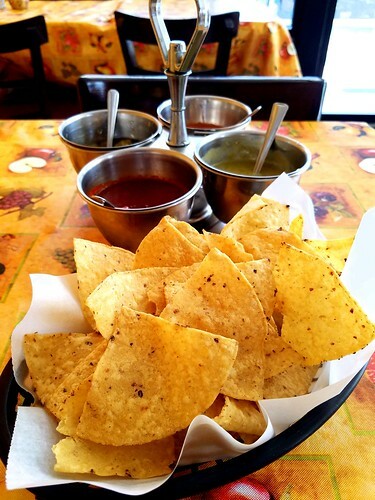 I had chips and the flight of salsas. There were tomatillo, a mild tomato salsa that reminded me of having a tamarind accent in it, a spicy tomato based salsa, and some pickled vegetables. Loved every crispy bite. 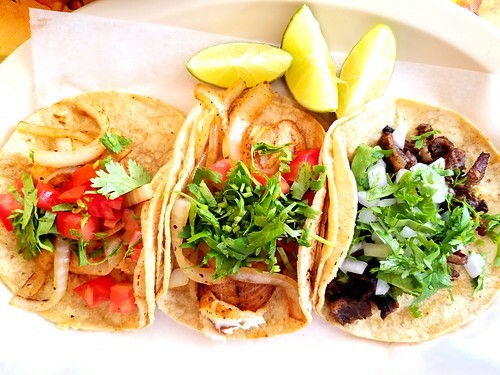 Starting with a flight of tacos, I had one camarone, one pescada, and one carne asada. Not stacked with a heaping of lettuce, tomato, cheddar cheese, avocado, salsa from the jar made in New York City, sour cream, and whatever else was in the refrigerator, these tacos were of the variety that my Mexican neighbours prepare. No meat was dry, no flavours were lacking, and I had room for shrimp a la plancha that came in a buttery sauce along with frijoles and rice. 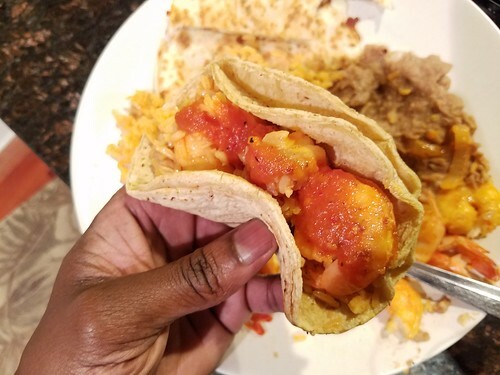 With the accompanying corn tortilla, I placed the plump shrimp, rice, and frilojes in them and devoured all of it in total silence. Oh, I also had two quesadillas with this delectable platter. Needless to say, my final two miles home felt like I had five more to go. But I was well fed. Chicago has more Mexican restaurants than anyone can keep track of and the beauty of them is that they are all authentic, not placebos to satisfy a common palate. 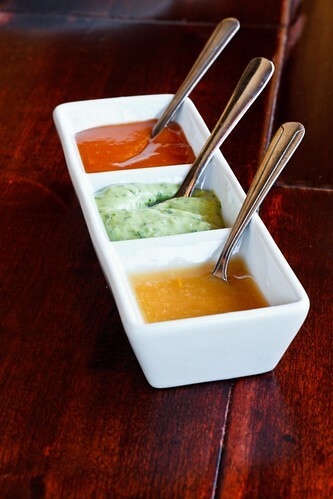 Super Jalapeño Grill is family-owned and operated, so you’re indeed getting genuine Mexican sabor. I have ordered from this restaurant for delivery and always felt they sent the best from their kitchen. The sit-down experience proved that they have pride in what they cook. I’m going back, but not after an intense workout routine and long distance biking. After a recent follow from a Chinese restaurant that is walking distance from my home, I decided to play nice and give it a fair try. I had feasted on Chinese food in mainland China, which resulted in me swearing off anything outside of China and Chinatowns. But let me just say that having discovered that Friendship Chinese Restaurant at 2830 N. Milwaukee Avenue has been in the Avondale area for several years, I am kicking rocks for just now find out about this bliss suite. I had missed out on some really, really, outstandingly delicious food because of my palate bias towards tasteless and nasty Americanized Chinese food. But no more. During my first visit, I was in curiosity seeker mode only. One thing I noted was the menu was one page, one-sided, with a nice listing of options. It was the fact that the menu was not a booklet, as found at countless Chinese restaurants. Playing safe, I ordered the appetizer sampler for a variety of small starters. 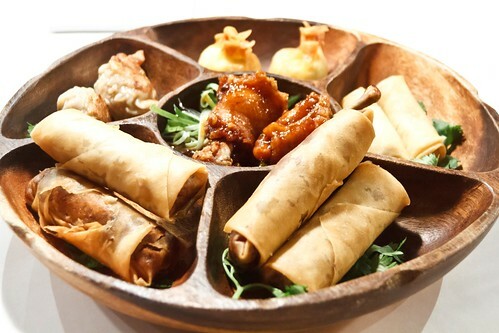 What arrived at the table were a large platter of a selection of appetizers, two apiece. 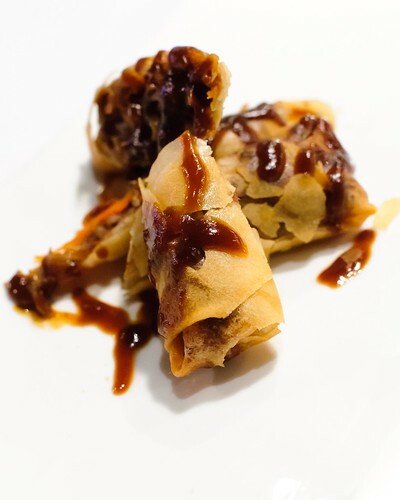 The Friendship egg rolls had seasoned, roasted chicken in them. The creamy crab rangoons burst with each bite. There were pot stickers, fish tofu kababs, and Peking duck rolls. And to make the appetizer sampler even more of a winner, the China wings in a faintly sweet and spicy sauce were well worth licking fingers afterwards. These wings must be a signature menu item. Because the appetizer sampler was filling and I was dining solo, I opted for only one other dish. 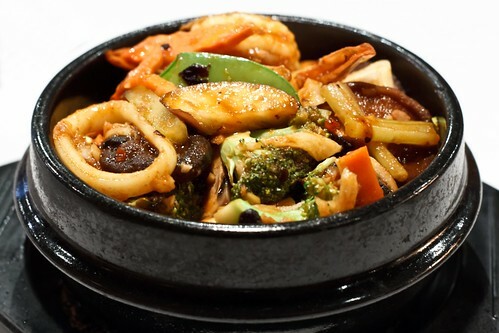 The clay pot offerings looked interesting, so I ordered the Szechwan seafood mix. Arriving at the table in a small clay pot along with a side of rice, this was a deal maker for me. Filled with shrimp, squid, and abalone, also with a medley of mushrooms, broccoli, and snap beans, I wondered why this restaurant had not been touted as one of Chicago’s best Chinese restaurants. Perfect seasoning, right amount of spiciness, and no MSG, it was easy for each bite to pop on the palate with the same satisfaction I remembered experiencing per my visits to Beijing, Shanghai, and Hong Kong. Not having ordered a lot on the first visit, I made a calendar entry for a return so that I could sample a few more items. There was the same welcoming service that I received on the first jaunt, so I was certain of the consistency with their staff. And since I had planned to try two main dishes, I started with the crispy Peking duck. I didn’t really pay close attention to this appetizer when I had it as a part of the sampler. Indulging it by itself really had me in love well before I had swallowed my first bite on the second visit. Tender duck that was not oily in a sauce that tasted like a marriage between soy sauce and barbecue sauce made for a plus as a starter. The first entrée I had afterwards was a plate of spicy peanut chicken. Just to give a little context, I hate peanuts. I have never been a fan of the texture, but I love peanut sauce and ordered the dish thinking I would get chicken in the sauce only. Well, I did get the chicken in the sauce, but also got peanuts in the dish. What popped into my head while I was going around the plate with the rice sopping up the last bit of the gravy was that I had devoured the peanuts without complaint. Maybe it was the enjoyment of the dish full of succulent chicken with fresh vegetable and a savoury sauce that made me forget about the peanuts. I intend to do it all over again. The second entrée was not on the menu. 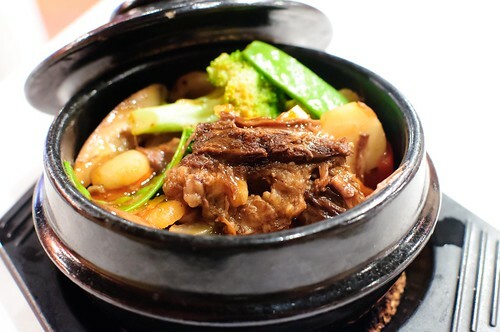 It was a new item that had not been added to the menu yet, a clay pot of short ribs with vegetables, a cauldron of absolute happiness. The short ribs were tender and seasoned like the kind of meat cooked for hours in a slow cooker. And the garden fresh taste of the broccoli, snap beans, mushrooms, and water chestnuts added that much more flavour to an already top dish. This will no doubt become a favourite to those who order it in the future. 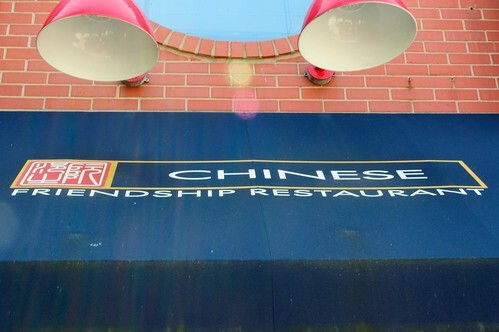 Friendship Chinese Restaurant is in a section of Milwaukee Avenue just north of the burst of growth that Logan Square is experiencing. There is a fair amount of foot traffic in the area so as revitalization moves along Milwaukee Avenue, there very well may be mention of Friendship Chinese Restaurant as a recommended spot. I must say that being someone who has had an aversion to bad Americanized Chinese food, I got a renewal of faith that there are some fantastic Chinese restaurants off mainland China. If I don’t find any others, I can vouch for Friendship’s authenticity being the draw that keeps me returning. Oh, I typed this review after blocking a few hours on an upcoming Saturday for a threepeat. A few years ago while enjoying the great outdoors and having some Mexican food at a neighbourhood restaurant, the owner had mentioned a nearby Cuban restaurant that he thought I would enjoy. The name he gave was Paladar, at 2252 N. Western Avenue. Like a lot of recommendations, I filed the name and then forgot about it until recently when I was walking along Western Avenue. Let me just start by saying that I should start taking recommendations seriously. Arriving early before the lunch crowd on a Saturday afternoon, I perused the menu, deciding on a common appetizer and leaving the main dish up to my server’s recommendation. 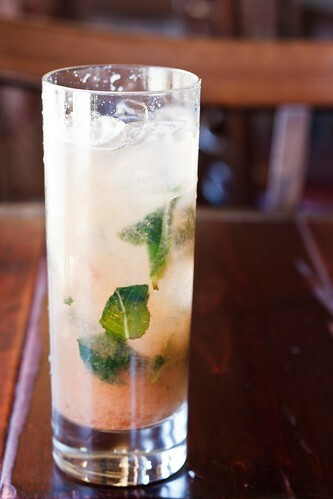 To wet my palate, the first cocktail I had was a guava mojito. Reminding myself not to down it like I was thirsting for water, it was hard to fight the temptation to turn it up and finish it in a few gulps because it was mixed just that well. Not heavy-handed with alcohol, it was apparent that the recipe had a good bit of it by the time I got halfway through the drink. 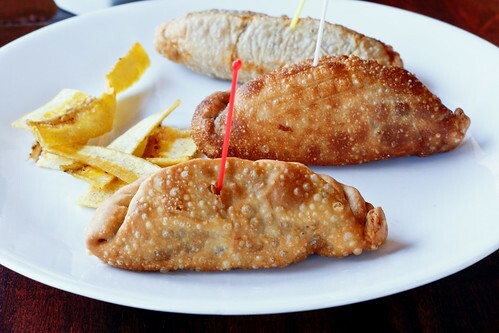 Along with the guava mojito, I had a flight of empanadas. There was a guava with cheese that was the best of that kind that I’ve had at any other Cuban restaurants in Chicago. The shredded chicken was flavourful enough that I made it a point to order several for take-away. The same applied to the beef empanada that I ordered in equal quantity to enjoy later. 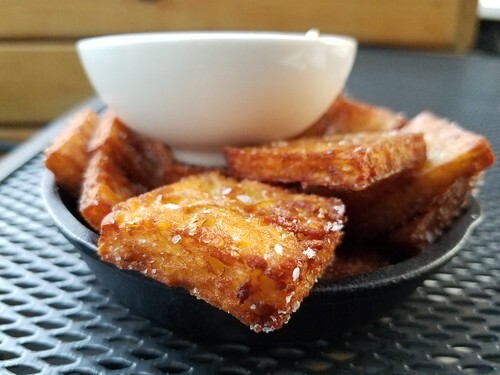 All served with three sauces — house barbecue, spicy avocado, and habanero — these baked treats were worth indulging what most would consider usual fare at Latin American restaurants. Usually when I go to Cuban restaurants I order what I consider safe dishes (e.g., ropa vieja sandwich or ropa vieja plate, arroz con pollo, or chuletas). This time I deviated by accepting my server’s recommendation for chivo. 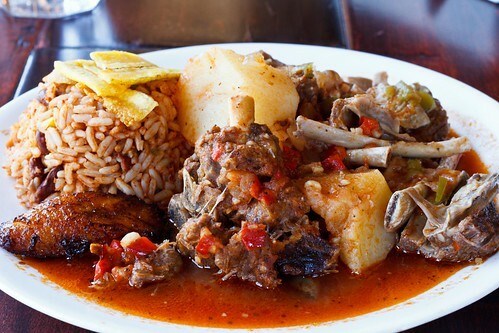 Having eaten more than my share of curried goat, the slow cooked goat stew served with congri and sweet plantains at Paladar was all the reminder I needed to develop a new love for this stew. From the meat falling off the bone without any help to the nice kick from the habanero to the sweet plantains that were caramelized rather than dry to yucca that fell apart on the fork, it should not have taken this long for me to indulge a plate of such an outstanding dish. 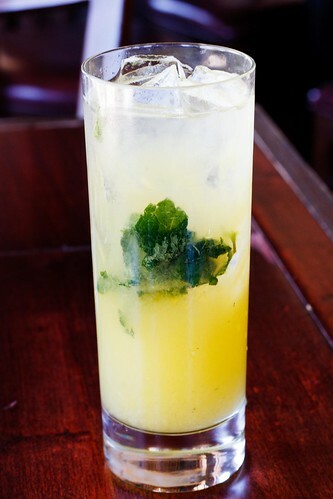 And the mango mojito that I had with the main dish was a case of a bartender’s concoction done correctly. For the finale, I opted for bomba. 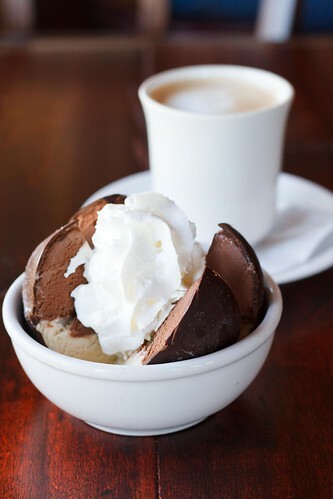 More like Italian tartufo, this came to the table as an ice cream ball of chocolate and vanilla ice cream encasing a maraschino cherry and slivered almonds, covered in a dark chocolate shell. I countered the cold with a café con leche, a perfect ending to a perfect meal. Perhaps I shall have traditional flan, bread pudding, or guava with cheese on my next visits, but the ice cream was a plus for my first pass. 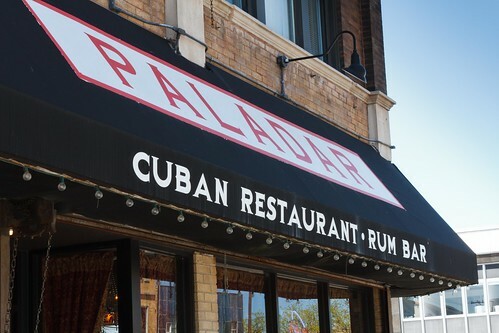 During the first few times I had walked past Paladar, the restaurant seemed empty. On entry during my proper sit-down visit, the restaurant still seemed vacant, but then I realized there are two rooms in the restaurant. I sat in the front room, which filled in quickly after I had arrived and ordered. Noting the various cadences of Spanish spoken in the front room, I detected sing-sing Cuban Spanish, rapid fire Puerto Rican Spanish, easy-come-easy-go Mexican Spanish, and the ting-ting-ting of silverware on my plate. Given Chicago’s many Cuban restaurants on its landscape, it’s fantastic having one in Logan Square landscape that’s within short distance to home. I will need to get some more empanadas when I run out of the ones that I ordered to take home with me. Hint, hint. With the New Year off to a good start and the temperatures not lingering below zero degrees, I have started to explore a bit more of Logan Square. And while looking for some international cuisine that I have not experienced in Chicago yet, I was surprised to see a new restaurant in Logan Square that piqued my interest. 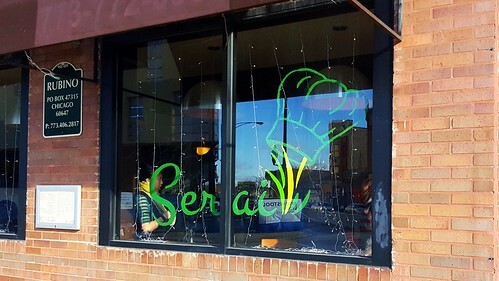 Only a month old, Serai at 2169 N. Milwaukee Avenue brings Malaysian cuisine to Chicago proper. I forwarded the online menu to a Malaysian friend for authenticity. He confirmed. I made a date. I went. I ate. I wanted to eat more. I will return and eat more. Rather than taking a chance going after work, I went early during the day on a Sunday afternoon. What became quite obvious while scanning the menu was that this restaurant is going to become a neighbourhood favourite quickly. It was during my ordering that I got a hint of why it draws a crowd. The service ranks a 25 on a scale of 1 to 10. 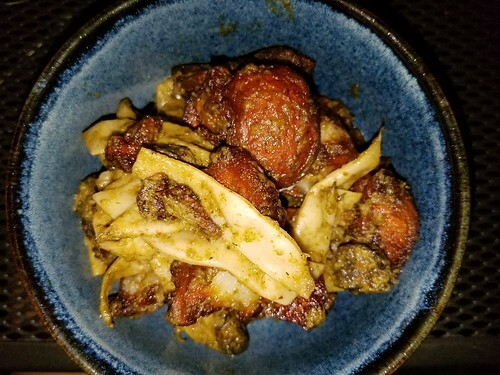 The server recommended that I treat my first visit as an introductory visit and come back several more times for a sampling of different dishes. The server started me off with roti pratha. Being a fan, lover, addict of curry, the dish was divine on my palate by default. 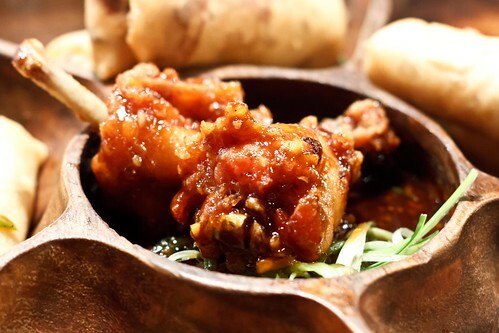 In this dish, there is the influence from Indian immigrants who came to Malaysia. The curry came with potatoes and bits of chicken. 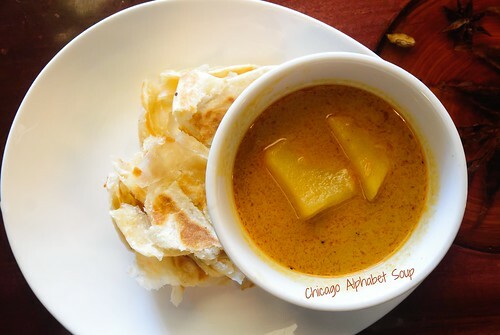 And instead of devouring this by using a spoon, I used the roti bread to sop the curry gravy. Thanks to the gravy being hearty, it stuck to the bread nicely and I was surprised that I finished the appetizer without needing use of a spoon. For a second appetizer, I had satay chicken over a small salad of cucumbers and onions with peanut sauce. 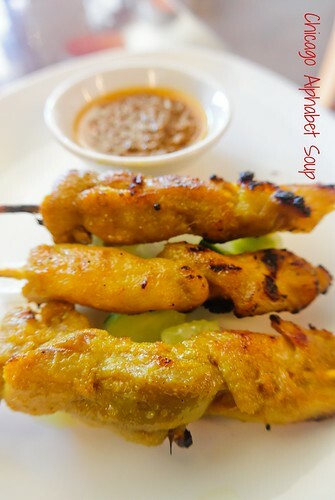 Most Thai restaurants have satay chicken on the menu and the server explained to me that Malaysian cuisine gets a bit of influence from Thailand. When food is so blooming good, I lose my purist notions. I had none while feasting on the chicken that came off of the wooden skewers with little effort. My Malaysian friend had mentioned that char koay teow was authentically Malaysian. Surprisingly, the server recommended it as an entrée I should try. This is a popular noodle dish in Malaysian cuisine that reminds me a bit of some Chinese noodle dishes. Again, my server clued me in that there is also a Chinese influence in some dishes. The recipe had blood clams, huge shrimp, fried egg, shrimp paste, Chinese sausage, and bean sprouts prepared in a savoury soy sauce. Absolute heaven on a plate. For a dessert, I opted for something traditional yet certainly different from what you’d expect. I indulged a cup of pulut hitam. One thing I have learned and love is that many Asian restaurants employ ingredients in dessert recipes that make you forget that you’re not having cake, cookies, or pies. The pulut hitam was prepared as black rice porridge with palm sugar and topped with coconut milk. Primarily an Indonesian dessert, and with a heavy presence in the Peranakan/Baba-Nyonya culture, it still was enough of an influence that I enjoyed it to completion. 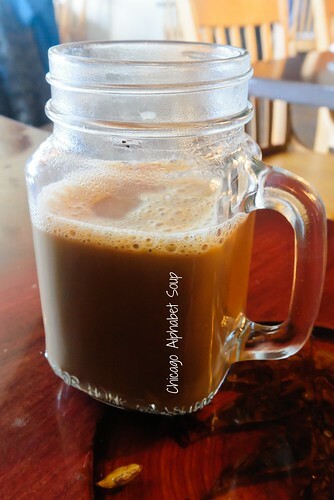 And with a cup of teh tarik, hot milk tea commonly called “pulled” tea, I was one satisfied customer when I finally extracted myself from my seat to depart. Serai has a BYOB policy. 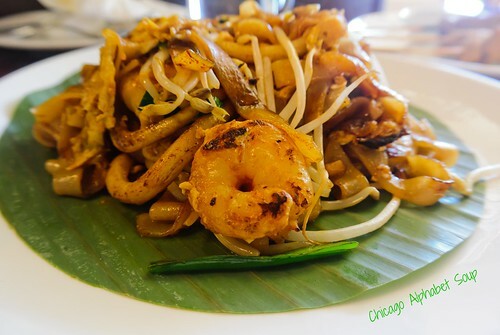 Given that they do an incredible job of sending the best Malaysian food from the kitchen that you will find in Chicago, drop by a wine shop and inquire as to a good red wine or rose that will go with Malaysian food. I have already made a tickler to remind me to go by a wine shop to get a recommendation for a bottle of wine to go with a rendeng dish. Priorities. Time away does the body good. No Facebook. No need to switch into reactionary mode responding to email. No twitching when the phone rings. Even abroad, it means eating without interruption. Oh, but to see how two weeks of stuffing your jaws seemingly fills in your flattened tummy. It’s back to the gym to work extra hard flattening the tummy again and making the abs pop — while showing some love at the many restaurants in Chicago. In the Southern end of Logan Square is Armitage Avenue. What was once a desert is now undergoing a silent renaissance. A year ago I stumbled upon what has become my favourite Italian restaurant in America. And all within walking distance are other swanky shops, cafes, and restaurants that seem to foster community rather than merely being magnets for crowds. 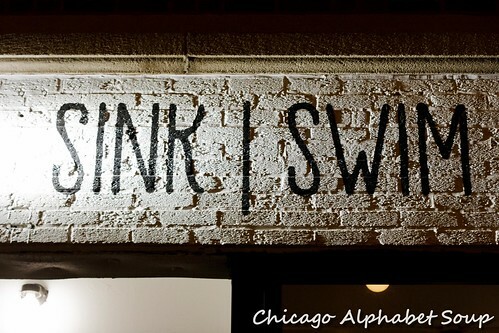 Sink | Swim at 3213 W. Armitage Avenue is one of the new restaurants that caught my eye. Had I not been on foot, I would have passed by it without a second glance. Nevertheless, I’m glad that I did. Waffling between jet lag and ravenous, I scanned the menu and made a quick decision. And just to be punchy, I ordered with the seasons in mind. I started with a crushed cucumber salad and a cocktail that had a gin base. 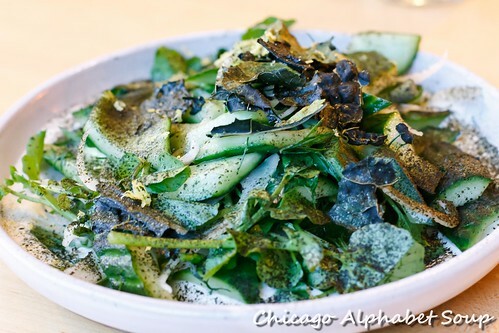 Expecting the salad to be a small plate, my eyes widened when I saw a rather substantial bowl of sliced cucumbers and seaweed served over creme fraiche. The dressing was not heavy, so I could taste the garden fresh cucumbers. The seaweed reminded me of crispy kale. And the cocktail was a splendid complement, refreshing on the palate without any alcohol being overpowering. For my second course, I had something that I thought would put me in the mind of summer. There was shrimp toast and a cocktail with a rum base. 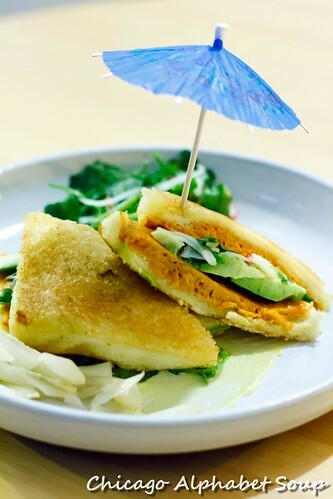 The shrimp toast looked like dainty little sandwiches. Once you got a bite of the shrimp with radish, aioli, and avocado along with a side of summer greens, what you may think is a small plate is not so small after all. I could have had another order of this dish if I hadn’t opted for a small degustation. I was quite impressed by the two savoury sandwiches. 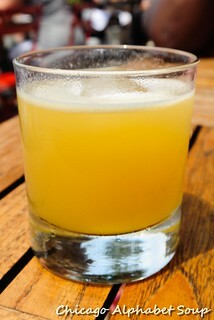 And the cocktail with rum as the main ingredient had me thinking of sunsets and recovering from jet lag properly. My third course was what I considered my autumn enticement. 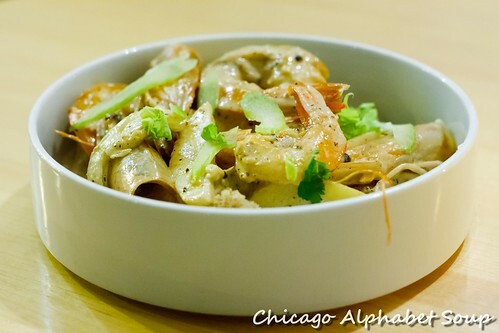 There was a large bowl of whole shrimp in a white barbecue sauce with fennel and smoked apples. I initially thought the dish looked cute until I bit down into one of the plump shrimp and immediately became addicted. This was the kind of entrée that one would find on the menu at refined Asian restaurants. By the time I got around to working on the third shrimp, I was talking to my food like I usually do. 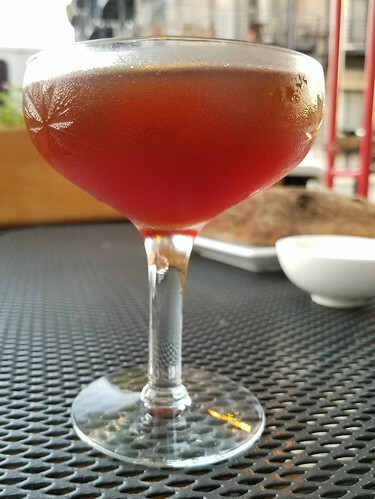 The autumn cocktail I had with Templeton rye was the coup de grace to finalize my deep sleep for the evening. I will have to check the bar menu because the selections the bartender matched with my meals were spot on. And since I was going all out with the dining experience, I had a finale of French pressed coffee with cream and a smoked chocolate cake. The cake was as cute as a button and as rich and decadent as a super moist brownie. Apparently before retrieving the cake from the oven, the chef allows the cake to get exposed to some smoked wood chips. I like different, but I love deliciously exotic and that is exactly what this cake was. Topped with dulce de leche and sprinkled with a generous amount of crushed hazelnuts, I was rather happy that Sink | Swim is in my neighbourhood within close proximity. Given I was on the hunt for something to eat, I had read a few reviews of Sink | Swim several weeks prior to my visit. There were complaints about the plates being too small, the smell of the sea in the restaurant, and a few other unsavoury points of contention. I asked my server about the small plates and the recommendation that he gave was that they are to be enjoyed with no more than two individuals because of the portions. Ah, yes, that makes perfect sense. A group of five or more having fits over a dish consisting of three pieces is a bit far-reaching. As to the other conniptions pointed out in reviews, the restaurant must have taken those assessments into consideration because what I experienced was a rather divine meal in a swanky atmosphere with top service. While I sank in my bed, thoughts of the degustation of four courses with the flight of three cocktails swam through my thoughts. And it had also occurred to me that I didn’t have a proper smoke afterwards. Oh, wait, I don’t smoke. When family visits, I avoid downtown tourist traps. Coming from cultural hubs like New York City, Toronto, Montreal, and London, nothing can kill an enjoyable stay in Chicago like going to some establishment and faking a smile throughout the experience. And when Caribbeans start sucking their teeth, you have to redeem yourself quickly. Well, during my sister’s visit, I took her to several ethnic restaurants where I have gone already and to a few restaurants where I have not been. 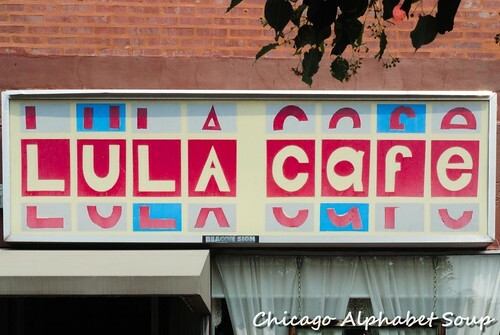 Lula Cafe at 2537 N. Kedzie Boulevard in Logan Square is one cafe that I bypassed for years because of arriving late and having to wait for almost an hour for a seat. With fantastic temperatures finally gracing Chicago, we had waited for an outdoor seat so that we could soak up some sun, feel the breeze, and enjoy some brunch. Since no brunch is complete without a cocktail, we had one apiece for starters. 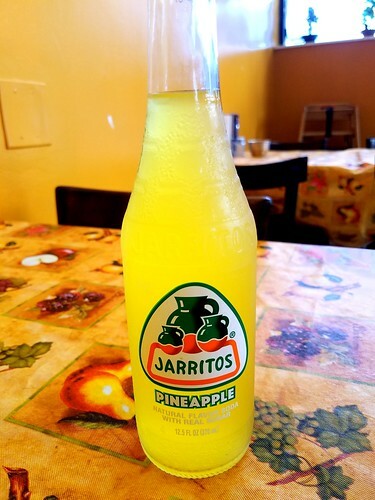 My sister had a la piña coronado, which definitely screamed Caribbean. 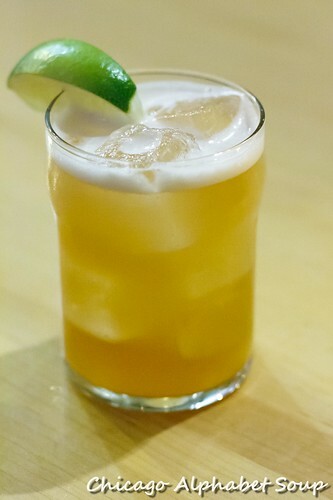 The recipe of agricole, amaretto, pineapple, coconut made for quite a refreshing cocktail. I am a fan of scotch, so I had the penicillin. The combination of scotch and ginger was a winner, for true. Having eaten something only a few hours before arriving at Lula Cafe, my sister ordered pancakes and scrambled eggs. To hear her describe them, they were tasty pillows accented with confectioners sugar. One highlight that certainly cannot be missed was the apple chicken sausage. Either the sausage was grilled or there was some liquid smoke used in the recipe, for it tasted like it had been smoked at a backyard barbecue. 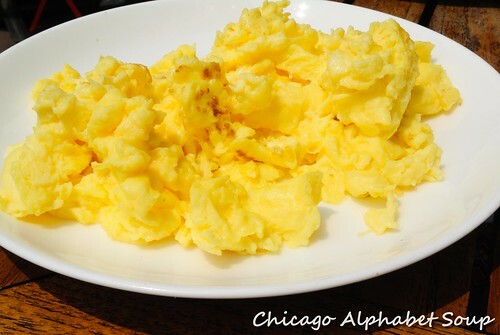 For me, I had scrambled eggs with cream cheese. 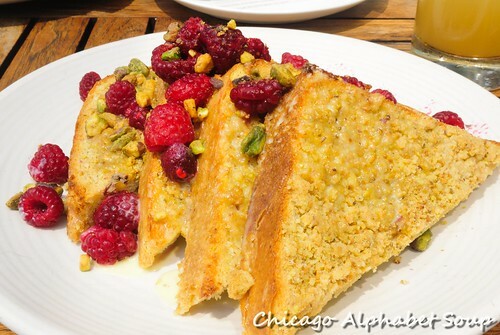 And for the main brunch item, I ordered brioche French toast that was crusted with pistachios and topped with raspberries. The French toast was so good that it didn’t require any syrup. This French toast may be one of the main reasons why there is a constant crowd at the cafe. Lula Cafe is a small cafe with limited seating inside and some patio seating outside. It seems as though there is a constant tide of customers and I imagine the ebb is during closing only. Even then, the service is fantastic. The output from the kitchen reminds me of home cooking, not restaurant cooking, and this may also be something what customers find so inviting. I had been tempted to take my sister into downtown to one of the numerous breakfast spots, but I am glad that I decided to go to a place closer to my apartment. I only have to remember to arrive as soon as the doors open when I go again.